Minature. Size can be customized via felting. 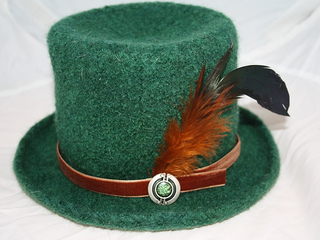 This jaunty steampunk inspired mini top hat is designed to perch becomingly on your head at a flirtatious angle, and is an open canvas for decorating to your heart’s content. From feathers and ribbons, to buttons and lace, you can also needle felt directly onto the finished fabric. For the more adventurous, look for fascinator supplies at your local craft shop and take it to a whole new level of steampunk glam. 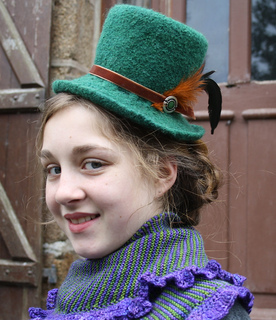 The top hat is knit from the bottom up at a loose gauge and then felted until desired size.